Macrosolen cochinchinensis (Lour.) van Tiegh known as the parasite, dalu-dalu (Sumatera), kemladehan (Jawa Tengah). Species : Macrosolen cochinchinensis (Lour.) van Tiegh. Many branched shrub. Twig with an enlarged section. Short-stemmed leaves, elliptical to lancet shape, sometimes ovate, glabrous 3,5-17 time 1,5-7 with slightly tapered ends, similar skin, shiny. 5-7 flowered wreath, most stand-alone, in the armpit, sometimes in a file on the old roads. Short flower stalks. Ellipsoid petal tube, 3 mm long circular, crown fringe very short. Crown as an mature bud 1-1,5 cm length bottom half widened, in the middle with 6 wings, above to narrow to narrow reed, ends into blunt cudgel, yellow or yellowish green, dark brown on the wings, yellow to red at the tip. Taju crown ultimately far back curved and twisted. Free part of the stamen 3-5 mm in length. Anthers form of mace. Fruit spherical shells, 6 mm long, dark violet brown finally. Growing up on the various types of trees (van Steenis, 1975). Parasite is a parasitic plant that attaches to the tree as a host. Growing from intermediate plateau to the mountains from a height of 800-2300 meters above sea level. Flowering in June-September. Appropriate harvest time in April-May (Anonim, 1999). The parts used are leaves or whole plant in the fresh state or after drying (Anonim, 1999). Leaves and stems parasite containing alkaloids, saponins, flavonoids and tannins (Anonim, 1999). Parasite from species Dendrophthoe containing quercetin glycosides (Hargono, 1995). Herba parasite potent anti-inflammatory, anti-bacterial and anti-inflammatory (Anonim, 1999). Other studies mentioned that the parasite is useful as cough medicine, diuretics, postpartum maternal health care, pain relievers, wound or fungus infection (Hargono, 1995). Water fraction and ethyl acetate fraction from leaf parasites that grow on petai able to dissolve kidney stones calcium in in vitro (Sasmito et al., 2001). The use of parasites with some other materials also efficacious in the treatment of cancer, tonsils and measles (Thomas, 1999). 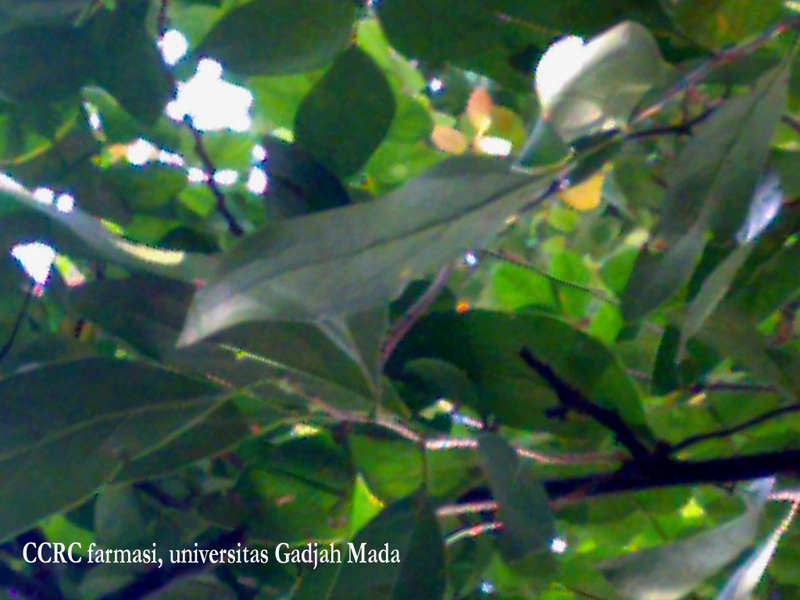 Empirically dekokta from M. cochinchinensis that grow on host trees tea has been used in cancer treatment (Jamilah, 2003). Many who survived so that traditional medicine was become the foundation of a new hope for cancer patients. While the compounds in the parasite has long been thought to act as an inhibitor of cancer malignancy. Parasites that boiled into a tea shown to be used as a support while undergoing chemotherapy drug. Some parasite species since antiquity has been used to prevent and treat various diseases. For example Viscum album L var lutecens Makino to treat back pain and herbs postpartum mothers in Japan, Viscum album L to treat cancer in Korea and China, even in some European countries be a non-conventional anticancer drugs and sold under the trade name Iscador (Artanti, 2004). Results parasite screening from the species Dendrophthoe pentandra and M. cochinchinensis growing on various host showed that the DPPH free radical scavenging activity method (Yen and Chen, 1995) that modified (Artanti et al., 2003), all water and ethanol extracts were tested active as an antioxidant ( IC50<50 µg/ml), whereas with BSLT method water extract is not toxic while the ethanol extract relatively more toxic and seems to depend on the type of host, this suggests that the possibility that the active compounds as antioxidants are not always toxic against brine shrimp (Artanti et al., 2003; 2004). Result of KLT and LCMS (Liquid Chromatography Mass Spectroscopy) showed that the water extract and ethanol extract of the parasite from species D. pentandra that grow on various host have the same major compounds suspected is a compound flavonol glycosides quersitrin which is a marker taxonomy from the family Loranthaceae. Quersitrin also been isolated from parasite duku (M. cochinchinensis) (Jamilah, 2003). Test results with cancer cells (in vitro), 3 new extract showed excellent activity in cancer cells, one of them is a parasite carambola leaf extract water (YI) (M. cochinchinensis). Test results of in vitro anticancer (Artanti et al., 2003), showed that the water extract of the parasite starfruit (YI) (M. cochinchinensis) have IC50 = 0,63 ppm against breast cancer cells MCF7; In vitro anticancer trials have also been conducted on cancer cells L1210 (IC50 = 41,0 ppm), HCT116 (IC50 > 20 ppm), and A431 (IC50 > 20 ppm). Cancer cell B16 viability assay results that this extract at a concentration of 100 ppm showed no toxicity (viability 93%), but at a concentration of 200 ppm and 400 ppm showed toxic properties (viability 26% dan 9%) (Artanti et al., 2004). DPPH test with Shimzu et al. (2001) method shows that water extract of this parasite showed antioxidant activity 95,7% at a concentration of 50 ppm (Artanti et al., 2004). With the research in in vivo expected to obtain scientific evidence regarding the efficacy of water extract the leaves of parasites starfruit (M cochinchinensis) as anticancer drugs it is also expected to add to the data laboratory collection of the usefulness of the leaves of starfruit parasite water extract as anticancer. Artanti, N., Jamilah, dan Hartati, S., 2003, Laporan Teknis Sub Tolok Ukur Pengembangan Senyawa Potensial antikanker dari Taxus sumatrana dan Benalu, Puslit Kimia LIPI, Serpong. Artanti, N., Jamilah, Agustina, H., Meiyanto, E., dan Darmawan, A., 2004, Laporan Teknis Sub Tolok Ukur Pengembangan Senyawa Potensial antikanker dari Taxus sumatrana dan Benalu, Puslit Kimia LIPI, Serpong. van Steenis, .C.G.G.J., 1975, Flora Voor de Scholen in Indonesie, diterjemahkan oleh Sorjowinoto, M., edisi ke-6, PT Pradnya Paramitha, Jakarta. Sasmito, Darsono, Zainul, K., Matrozi, 2001, Kemampuan Fraksi Air dan Fraksi Etil Asetat Daun Benalu Petai Dendrophtoe petandra (L) Miq Melarutkan Batu Ginjal Galsium In Vitro yang Diuji dengan Metode Aktivasi Neutron Cepat, Majalah Farmasi Indonesia, 12 (14) 186-193. Thomas, A.N.S., 1999, Tanaman Obat Tradisional I, Penerbit Kanisius, Yogyakarta, 99-101, 124-125.